Disturbing footage has emerged of Desmond Hague, the CEO of Centerplate (a company that provides catering for more than 300 major venues in North America ) brutally abusing a dog. Centerplate is disciplining Hague, but many feel that it's not enough. 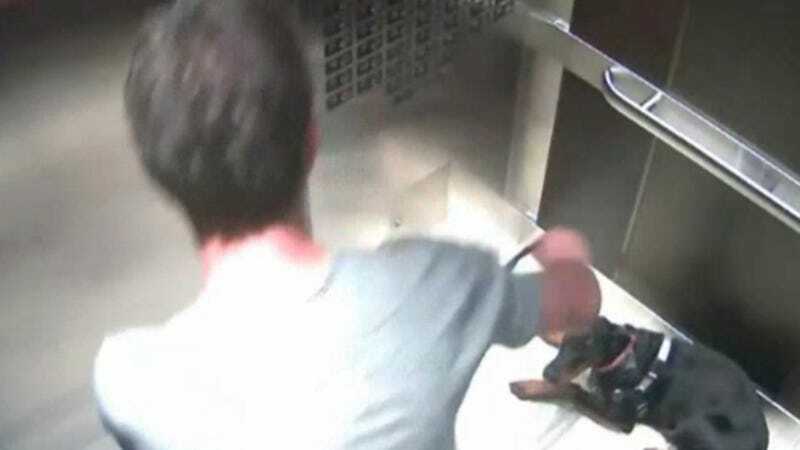 Hague, who claims the dog (named Sade) isn't his, even though it's registered to him, was caught kicking the frightened doberman pinscher while he was in Vancouver in July. The video of Hague's attack on Sade is here, although like SFist, I can't recommend that you watch it. It's very violent, with Hague kicking the dog and choking it by pulling its leash. An investigation has revealed that Sade shows a great deal of fear and anxiety. "The way she behaves certainly gives the indication of fearfulness, and that indicates she has received this treatment before," said Laurie Chortyk of The British Columbia Society for the Prevention of Cruelty to Animals, which is recommending that Hague be tried on criminal charges for his assault on the dog. The dog is currently in the care of the SPCA, after officers visited Hague's apartment and found the dog in a cage, sitting in her own urine, without access to food or water. What's outrageous to many is that Centerplate, which released a statement saying that Hague will be attending counseling, doing 1,000 hours of community service and donating $100,000 to an organization that helps animals, has not fired Hague for his mistreatment of Sade. As a public figure, Hague's image is directly tied into that of the company, and while what they're asking him to do is a start, it makes no sense why they'd still want to work with him considering that many sports fans in Vancouver and across Canada are calling for a boycott of the stadiums with which Centerplate works. As someone who lives in a city where Centerplate provides the concessions for all the stadiums, I would be very uneasy supporting them considering that they're not disciplining Hague in a more serious way. And if you plan to attend a venue which Centerplate services, you may want to bring your own food. Or contact the venue and ask them what they plan to do about this incident. Anything, actually, because animal abuse is awful and should be taken more seriously.